Californian and New Zealand rabbits for restaurant and private meat sales. 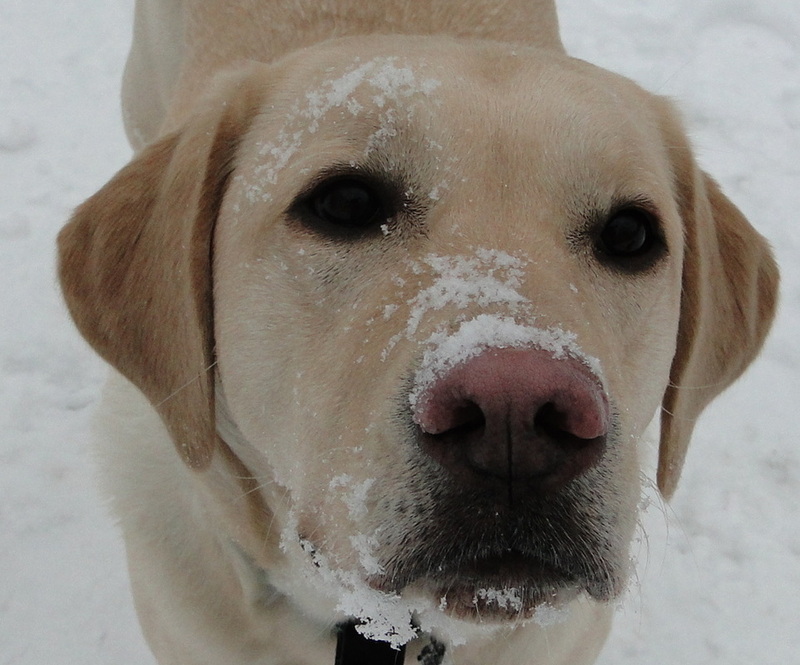 We also offer quality stock for breeding and show purposes. 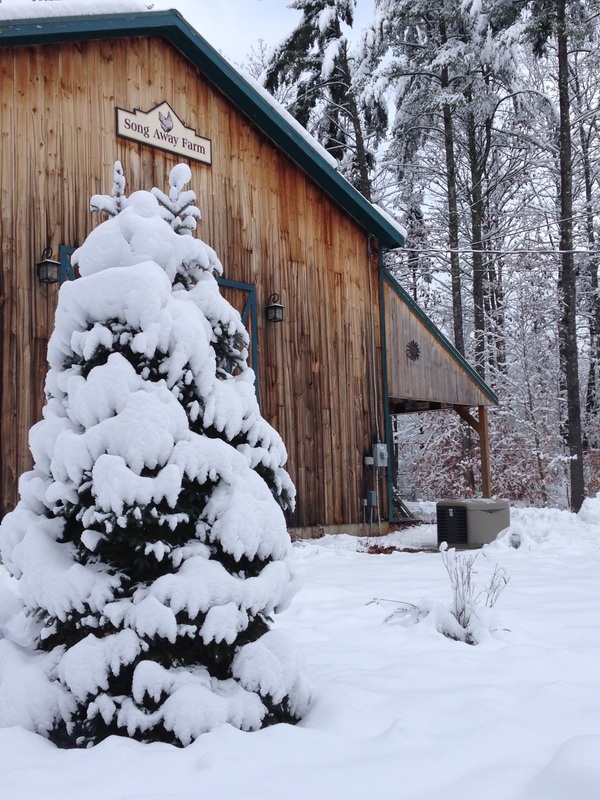 Our rabbitry includes a climate controlled space for the rabbits, a dedicated processing room and a 10 kilowatt solar array to provide all of our electrical power needs. All of our processed meat is vacuumed sealed in a chamber sealer. This method removes the air in the packaging, which makes the meat less likely to have freezer burn as well as keeping fresher for longer. Broiler chicks - housed inside for a couple weeks until they feather out. Unlike the industry standard our broilers are raised outside in spacious conditions. They are kept safe from predators with an electric fence and have a shelter to protect them from rain or too much summer sun! They really enjoy the cool grass in the morning and evenings. Our broilers are humanely processed by us, on our property, and do not have to deal with the stress of being transported to a processing facility. The poultry shrink bags we use are BPA free unlike some of the other bags on the market. "Just had to send a quick note to say how delicious the rabbit and chicken are. Shortly after our visit, I made a rabbit dish with a tarragon sauce (have lots of tarragon in my garden!). It was delicious. Over this past weekend, I roasted one of your chickens and our whole family agrees it's the best chicken we've had. (and we've tried lots of chickens from local farms!) I used a simple brine and then roasted it with vegetables. So delicious! Our meat chickens enjoying some summer sunshine and the black-eyed susans! locally raised, quality rabbit meat to your farm to table menu? 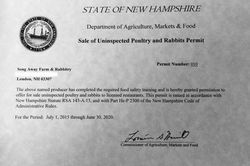 Song Away Farm is the producer of quality, New Hampshire raised rabbit and is registered with the state’s Department of Agriculture to sell rabbit meat directly to New Hampshire restaurants. Unlike imported or other locally raised rabbits, Song Away Farm’s rabbits are humanely raised and fed a varied and high protein diet consisting of high fiber alfalfa pellets, oats, organic wheat fodder, and an unlimited amount locally sourced hay. Our farm operates year round and we process our fryer rabbits on a regular weekly schedule, thus ensuring their availability at all times. Processing occurs in a sanitary room that is dedicated for the purpose, and the carcasses are immediately chilled to between 35 and 40 degrees. After final rinsing, the meat is vacuum packed in a chamber sealer and promptly refrigerated. Vitamin E, Sodium Hydroxide and Fragrance. Soap Ingredients: Olive Oil and Sodium Hydroxide. Soap Ingredients: Olive Oil, Sodium Hydroxide and Lavender Fragrance and Lavender Blossems. Our broiler chicks will be arriving the second week in April! on a June 3rd workshop regarding raising & processing broilers. For more information regarding this class or purchasing some of our chicken meat this season please contact us. Song Away Farm's New Delivery Mobile! ​Thanks to the new 2016 Prius we have more than doubled the efficiency of our deliveries. Our old subcompact Jetta wagon was no slouch at 25-28 MPG, but the Prius has delivered a whopping 60 MPG average in its first 3000 miles. Along with the solar array added in September, the new (and surprisingly roomy) car is helping to make the farm's carbon footprint a bit smaller. September 9, 2016 11:52 a.m.
​Song Away Farm started generating power! The whole farm is now being powered by 35- 285 watt Suniva solar panels. They were installed on top of the barn and tied into the whole electrical system. and allowed us to bank the extra kWh's for those short winter days that are approaching all too quickly! So here is wishing for many bright sunny days (rainfall only between the hours of 7pm and 7am). and how it will be powering Song Away Farm well into the future contact us. 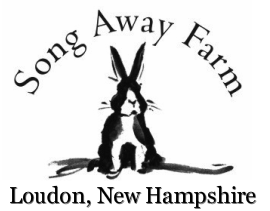 ​and be sure to tell him Steve & Kay, the rabbit ranchers from Song Away Farm, sent you!! 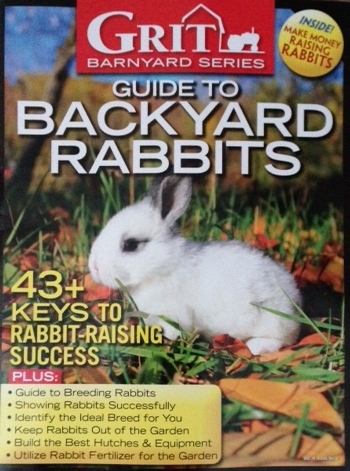 For a second year in a row a Song Away rabbit has been published Grit Magazine's Guide to Backyard Rabbits! 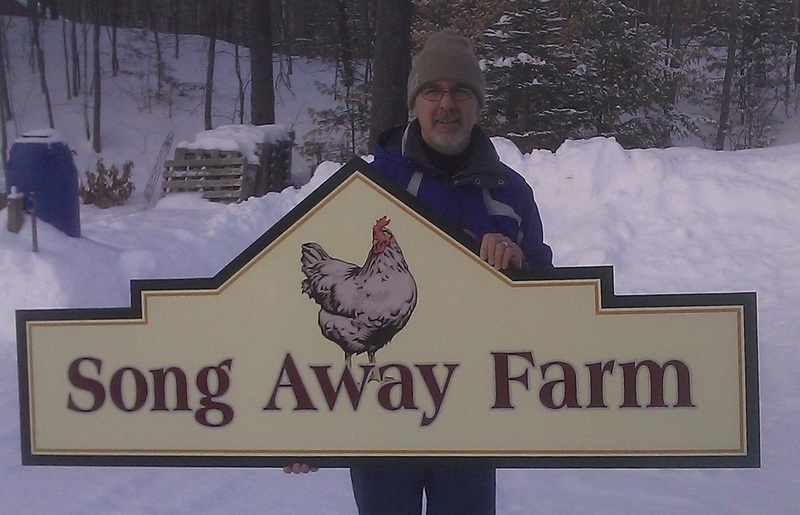 Look for the addition of farm raised broilers (5 1/2+ pound average) for sale this summer! on a summer workshop regarding raising & processing broilers. Processing room is completed - poly walls up, lights on & doors attached!! 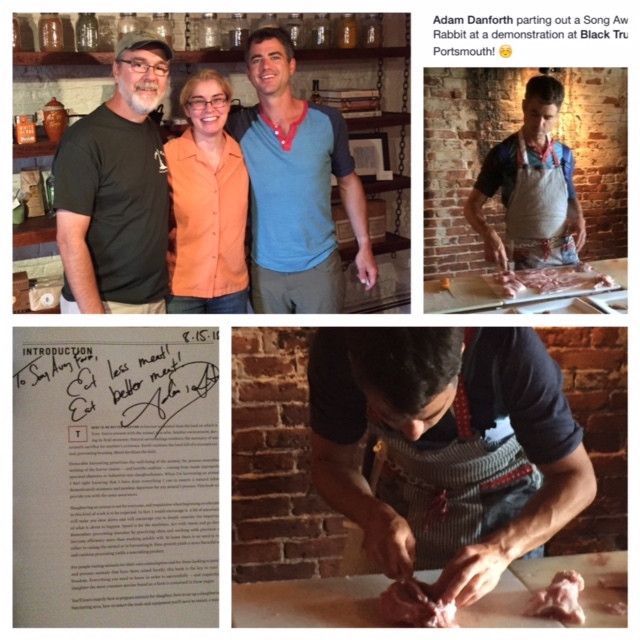 at the Black Trumpet Restaurant & observe him parting out one of our rabbits as well as a locally raised ewe. The NEW Lakes Region Local Food Guide is out! Click here to view a copy and start eating local! "The two Cali does I got from you back in March just kindled their first litters. One doe had 9 kits and the other had 7, so the numbers were perfect and everything looks just great. We have a drawn up 10' x 12' floor plan for a new rabbit processing room. At the end of April we had specialist from the Cooperative Extension, facilities engineers and others come in to give us valuable input regarding our design and also other options we may want to consider. 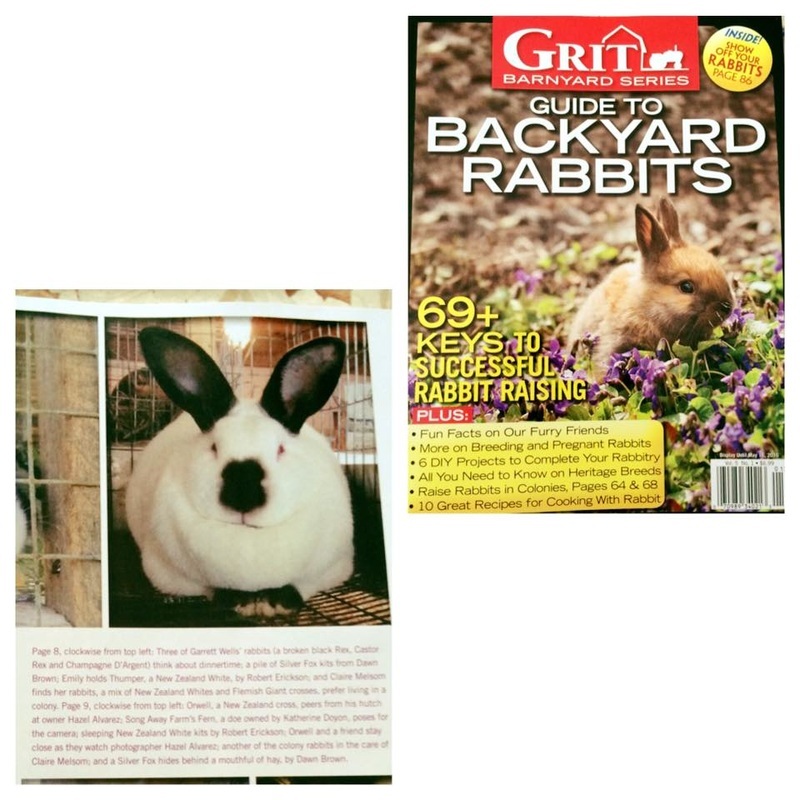 in this publication of Grit Magazine's Guide to Backyard Rabbits! 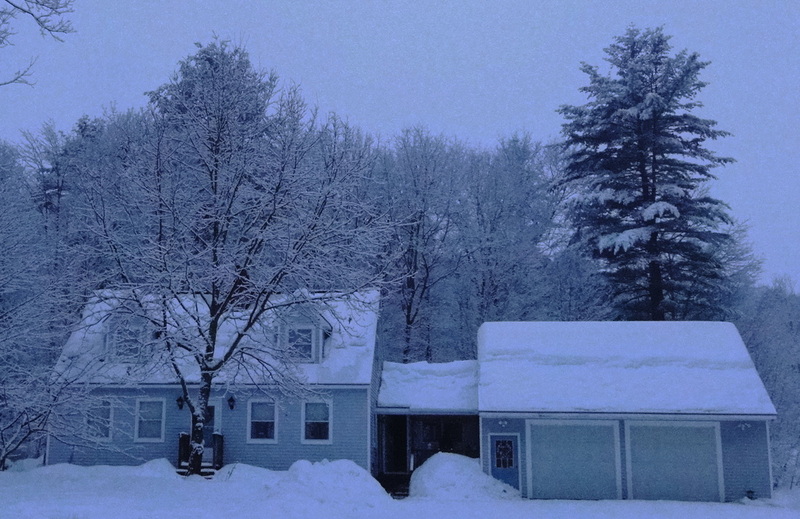 At Home In New Hampshire recently did a blog on eating local. 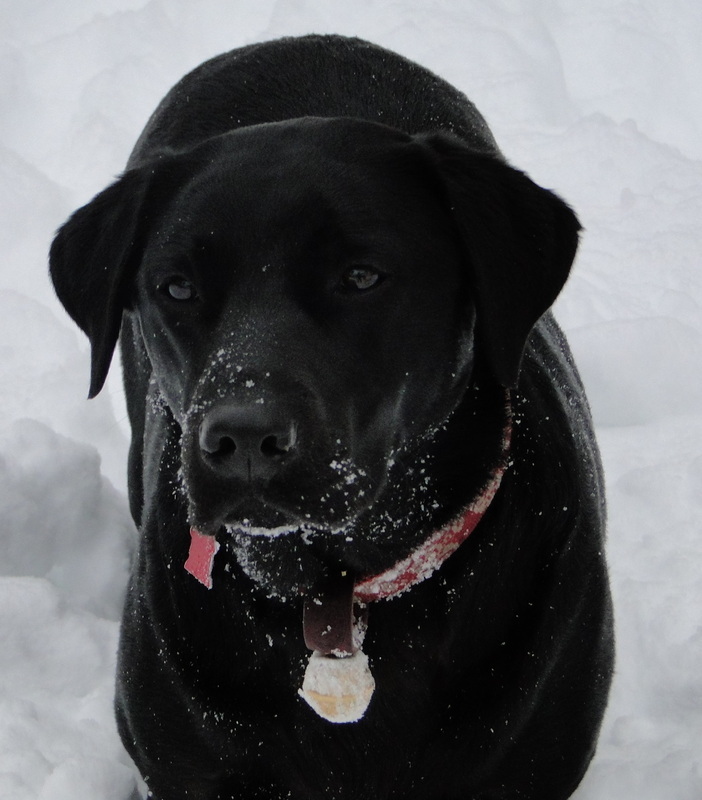 Click here to see what Cindy had to write about Song Away! Bill Thibeault & his friend Paul stopped by to look for a Californian buck. and extremely proud to have Tebo's Rabbits bloodlines running thick throughout our stock! 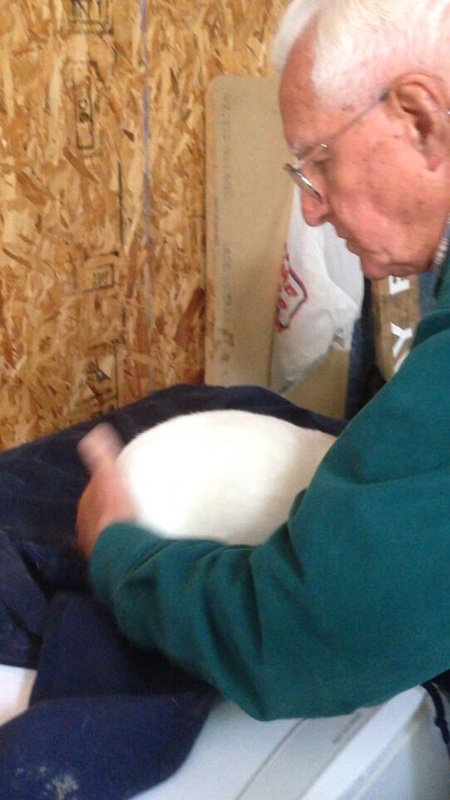 To read more about Bill and Tebo's rabbits click here. Bill evaluating Song Away's Monty. Bill evaluating Song Away's Klaus - his friend purchased Klaus for his breeding program. 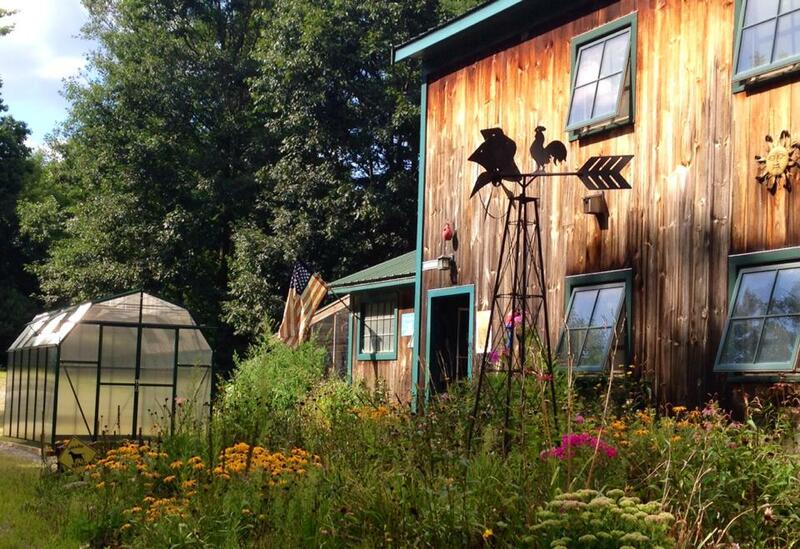 August 2014 This greenhouse is actually will be a "cold house" based on Eliot Coleman's Winter Harvest Handbook. Some of the harvest to be shared with the rabbits during those cold winter months! hard to find good help these days ... these three are often found lounging around! 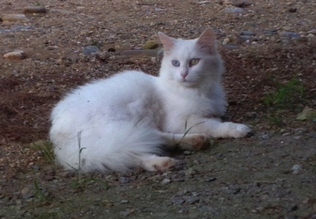 Ms. Kitty - "Biological Exterminator"
"Where there is music, there is love!"